Very rare cabinet photo of Grand Duke Alexei Alexandrovich by famous Levitsky. The image has no date stamp, but looks to be a circa of 1890's or so. Photo measures approximately 6 1/4" by 4". Condition is good to fair. The card may have light wear, scratching, toning, fading, minor staining, spotting, soft or dinged corners and slight wear,as shown in pics. A nice image, with great display potential. The Grand Duke Alexei Alexandrovich Romanov of Russia was born in Saint Petersburg on 14 January 1850 (4 January O.S.). He was the son of emperor Alexander II and empress Maria Alexandrovna. He was a younger brother of Grand Duchess Alexandra Alexandrovna, Tsarevich Nikolay Alexandrovich, Alexander III of Russia, Grand Duke Vladmir Alexandrovich. He was an older brother of Duchess Maria of Saxe-Coburg and Gotha, Grand Duke Sergei Alexandrovich and Grand Duke Paul Alexandrovich. Alexei was chosen for a naval career since his childhood. At the age of 7 he received the rank of midshipman. In 1873, Alexei Alexandrovich was appointed head of the Imperial Naval Guards. He was also appointed member of the section for shipbuilding and naval artillery of the Russian Naval Technical Committee. During the Russo-Turkish War (1877–1878) he was promoted to commander of the Russian Naval Forces on the Danube. On 9 January 1878 he was decorated with the Order of St. George – Fourth Degree for "tireless and successful management of the naval forces and equipment on 14 June 1877 for the construction and maintenance of the pontoon bridges and crossings at Zimnicea, Pietroşani and Nikopol and for the successful measures for protecting these crossing from destruction by enemy forces." In 1880 he was promoted to general adjutant. 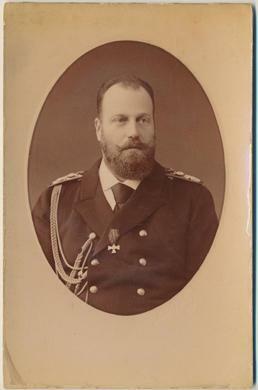 In 1882 after the accession of his brother Alexander to the throne, Alexei was appointed head of the Naval Department, replacing Grand Duke Konstantin Nikolaievich. In 1883 he was also appointed General-Admiral of the Russian Imperial Fleet. Though his control over the day-to-day affairs of the military was limited, Alexei was involved in naval and military planning. His influence over the Tsar gave him a powerful say in strategic decision-making. Besides being the head of Russia's fleets, Alexei was also in command of the naval cadet corps, the Moscow guard regiment, the 37-th Ekaterinburg infantry regiment, the 77-th Tenginsk infantry regiment, and the 17-th Eastern Siberian infantry regiment. As commander in chief of the navy, his main concern was the constant modernization of the fleet, taking into account the rapid technological progress. During his tenure he ensured a fivefold increase of the navy's budget. He was able to launch a series of pre-dreadnought battleships which were replacing the old ironclad ships. At the outbreak of the Russo-Japanese War in 1904, the Russian First Pacific Squadron was able to resist the Japanese attack during the Battle of the Yellow Sea. However, the squadron was destroyed during the Battle of Port Arthur, and the Baltic Fleet, sent for reinforcement, was completely defeated in the Battle of Tsushima. 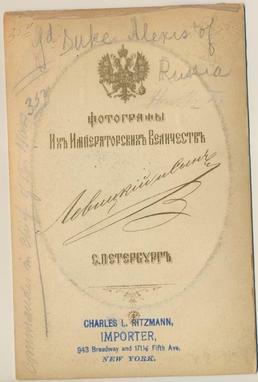 On 2 June 1905 O.S., Alexei was relieved of his command and retired.